Riders waiting at the registration area for the rider's meeting Saturday morning. 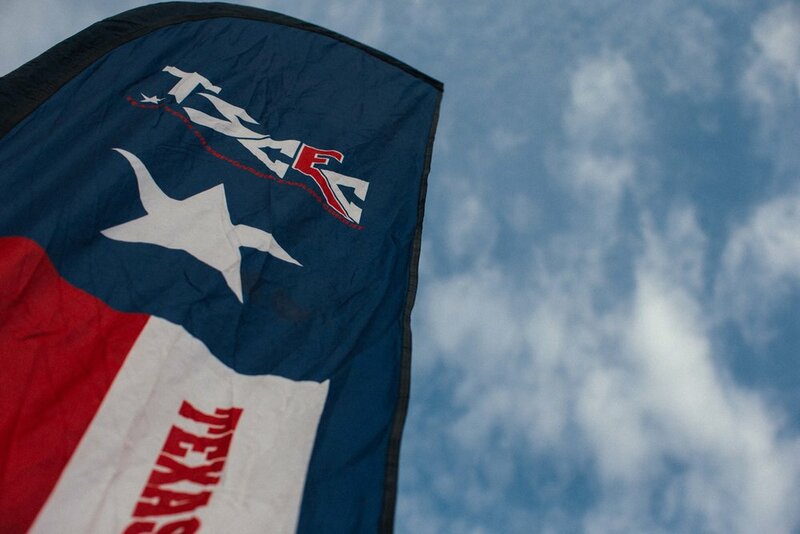 When it comes to Texas enduros, it's safe to say that I've been to just about every race at least once in the last ten years. 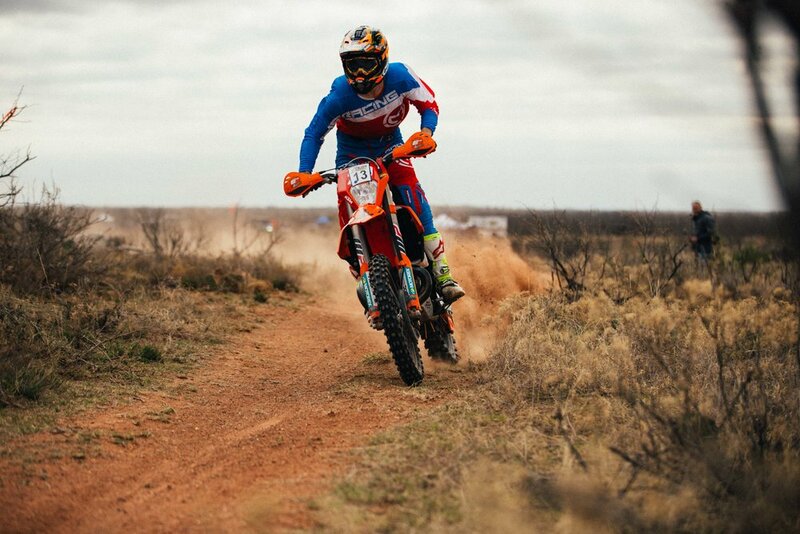 This past weekend, I had the opportunity to race the Lone Star Enduro that is hosted by the Lubbock Trail Riders. I missed this event last year due to work so I was thrilled to be able to race it this year. The Lubbock Trail Riders are known for putting on top quality events that are family friendly and use some of the best trails that the state has to offer. After a prayer and playing of the National Anthem, riders were briefed on what to expect out on the course. The event was a two-day enduro that had participants race a sprint format on Saturday and then a regular restart format on Sunday. The two sprint courses that the club put together were very high speed and very fun. My 300 XCW rarely gets into sixth gear and it did multiple times throughout the day on Saturday. The test times were close but I was able to win all but two of the test and came away with the overall. 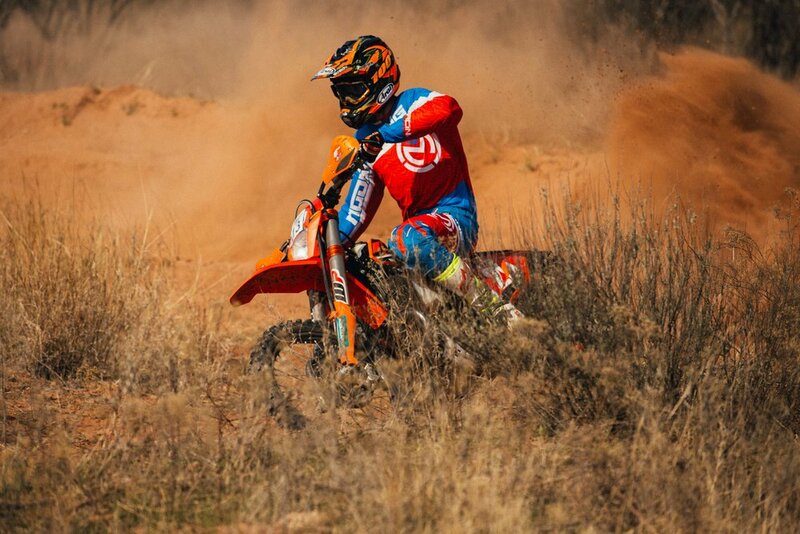 Charging into the finish of one of the sprint enduro tests on Saturday. Saturday after the sprint enduro concluded, the mini enduro took place right at camp. The club laid out a really neat course for the young riders and I can't remember the last time that I had seen so many young competitors at an event. After the mini enduro, it seemed like all the youngsters just kept turning laps for fun until sun went down. Young racers lined up for the start of the mini enduro. Sunday, it was back to the restart format that most TSCEC participants are accustomed to and we had a total of five tests on the day. The trails consisted of dry, flowy trails that worked their way along creek beds, canyons, and mesquite pastures. I had forgotten how much fun the trails are and constantly found myself screaming enthusiastically after hitting a berm or natural jump just right. The A course always has the challenge of riding through the notorious section named, Rambo. Sunday was no different and the best way to describe riding through Rambo would be wrestling with a gorilla. Picture 2nd gear single track with cedar trees in your face that try to knock you off your bike in the corners. Oh yeah, there's also rocky creek bed climbs, rutted descents and powdery slot car climbs that are downright frustrating too. My 300 was the ideal bike for this section and I often found myself lugging the bike in 3rd gear in some of the sections to increase traction and ensure that I would carry speed and not waste energy. I had a pretty good get off half way through the nine-mile test and ended up in a ditch trying to get back on course. Once I got going, I tried to be smooth but was so mad that I was taking it out on the trail! Silt berms and cactus all day long! The final two tests of the day were my favorite. They were high speed flowy trails with excellent berms throughout. The last one ended with a really fast creek bed section that had some primo ruts near camp. I finished the day in first at took the overall on the weekend. A huge thanks goes out to the Lubbock Trail Riders club. 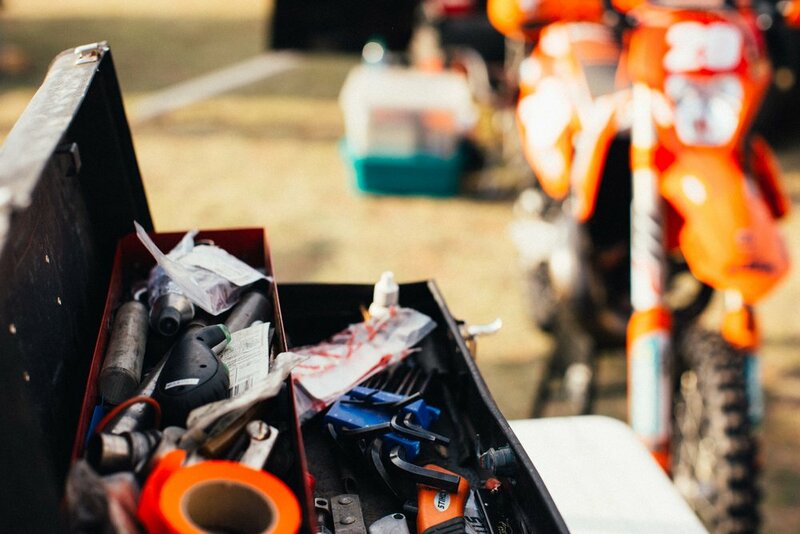 They put on a top notch enduro and set an example of what it means to put on event. 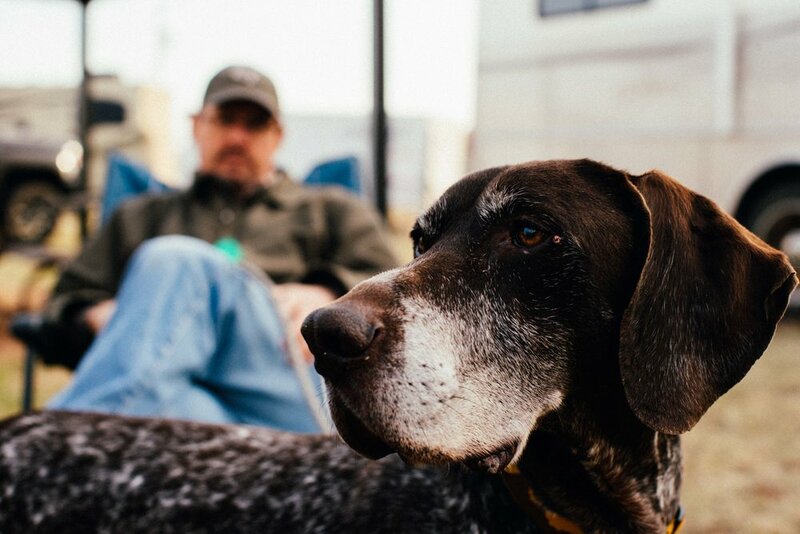 It was great seeing so many familiar faces over the course of the weekend and sharing bench racing stories while enjoying Grumpy's cooking. Riding a transfer section out to the first test on Sunday. For anyone near the panhandle of Texas, I highly recommend this event. 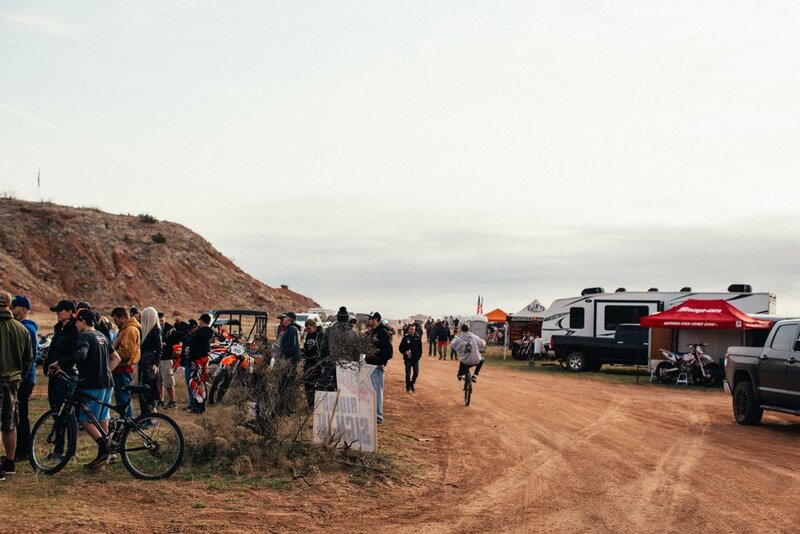 If there is one Texas enduro that you should put on your calendar for next year, it's this one. I've known these guys since the early 2000's and it's great to still get together. From left to right: Chad Metcalf, Kelly Simmons, and Chance Willis. Chance was the competition chairman, Chad was in charge of something really important I'm sure, and Kelly was just another hard-working club member that takes a lot of pride in the event. Thanks guys! This photo is ten years in the making! Michael Kasberg was my college roommate at UNT and was a full on moto guy. He used to bag on me for my Moose gear, hand guards, and a bike that had a kickstand. He's almost come full circle now and is a fellow AA class competitor and Moose Racing sponsored rider. If I can convince him to get a KTM with a kickstand next year my mission will be complete! The 2017 300 XCW checks all the boxes for me. It handles great, is easy to ride, and will go plenty fast! Bonus is that it has a headlight, taillight, and kickstand for trips to the grocery store or nighttime adventures. A big thanks to my Dad for taking some actions shots of my throughout the weekend and the video clips are from Michael Kasberg and Kolten Barlow.